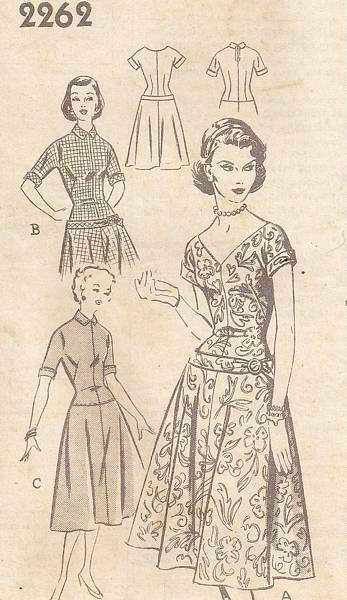 Vintage mail order sewing pattern 2262, hand dated 1955. Dress with long line bodice has dropped waistline and flared skirt. Front V neckline with slightly lowered back neckline or high front and back necklines with small pointed collar. Both versions have side placket zipper closing and in addition the high neckline version has back neckline zipper. Short or above elbow length sleeves are cut in one with bodice. Size 12; Bust 30; Hip 33. No waist measurement listed. Pattern is used and complete. The pattern pieces have no printing and factory precut to size and perforated for identification. Pattern pieces are in supple condition with light foxing to some of them. Instructions are in very good condition. This was a mail ordered sewing pattern so there is no traditional envelope/sleeve. Comes with original mailing envelope from "Progressive Farmer".